When you see a Tetilla cheese, the first thing you will notice is its shape. When you taste a Tetilla the first thing you will notice its rich creamy taste and texture.Tetilla is a mild, Spanish hand-made cheese and so very different from the well-known Manchego cheese. The conical cheese from Spain is made from pasteurized cow’s milk and has a yellow rind with a slightly greenish cast. Get this…the cows graze “on the lush pastures behind the coastal mountain range.” Doesn’t that sound lovely and luxurious? The pale yellow paste is elastic and easy to slice, it has some irregular holes. 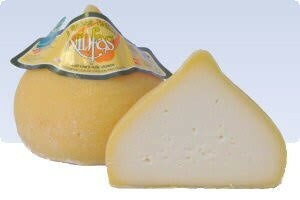 The cheese smells of milky meadows, of a very young cheese and it has an attractively creamy melt in the mouth. The flavor is similar to a Fontina Fontal, however more flavorful. As far as looks, this cheese make a very nice center piece on a cheese platter. It’s delicious melted over chorizo, in mac and cheese…use it anywhere you would normally use a creamy cheese such as gruyere.